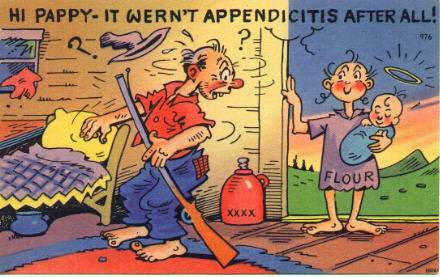 Just a generation or two ago many hillbillies still didn’t know the exact details of how a baby came to be. In fact a lot of them didn’t know any general details either. A couple generations ago I didn’t know anything about the subject myself, but that was mostly due to my age, which was none. This man and his daughter had been having some special family lovin’. One day he was surprised by the arrival of a newborn son, errr uhhh grandson, well in any event a kid was born and wasn’t expecting it. Little buddy, your daddy-papaw loves you and you’re gonna grow up to be a fine plow boy someday! In my honest opinion, the world needs more hillbillies. Keep ’em comin’ Ma and Pa.